November is Research Month at Providence Healthcare, St. Joseph’s Health Centre and St. Michael’s Hospital. To celebrate the impact that research makes on policy, practice and, most importantly, patients, several activities are taking place throughout the month that staff are invited to attend. These include unique rounds, lectureships, workshops and networking opportunities. See below for a full calendar of events and join us for as many of these as you can. Our theme this year is “TOgether”, as we celebrate research across the three sites of our network. The opening will start with a brief overview of the research being conducted at each site, followed by a reception with coffee, snacks, fun photo ops and more. Remember to come to pick up your Research Passport! 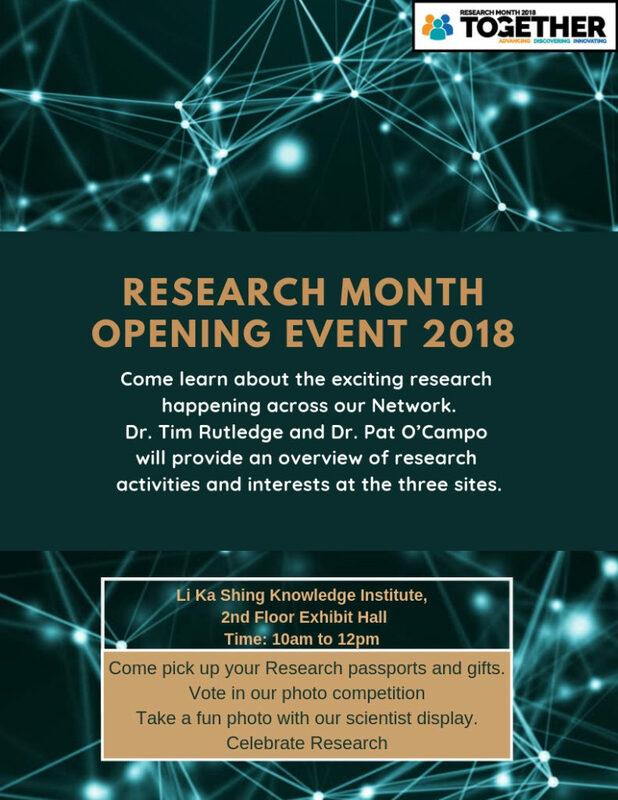 10:00: Reception, with light refreshments, photo fun, voting for the Research Month photo competition and gifts for attendees. Effective teams do not suddenly appear fully developed and highly motivated. They require commitment, effort and a leader who facilitates open dialogue. This workshop provides practical tools and templates to support managers in building effective work teams. Register through the Learning Centre, spaces are limited. If you have a poster presentation coming up, or want to learn more about creating and successfully executing poster presentations, then this workshop is for you! The workshop will cover design do’s and don’t’s, introduce participants to templates and software that can be used to create posters, and discuss strategies for preparing for the presentation itself. While the content is aimed at those who are new to participating in poster presentations, experienced presenters may also find the content valuable. If you plan to attend the workshop in person, please register here. Presenting on behalf of the Biomedical Delivery Systems (BDS) Research Theme. The research program of the Snoeck lab primarily focuses on hematopoiesis with the aim to improve bone marrow transplantation and gene therapy targeted at hematopoietic stem cells (HSCs), and gain insight in leukemogenesis. To achieve a deeper understanding of the mechanisms involved in self-renewal of HSCs, we have mapped genes underlying quantitative genetic variation in the behavior of HSCs among inbred mouse strains. After identifying allelic variation in the Prdm16 gene as one of the underlying mechanisms, the lab now focuses on the mechanism of action of Prdm16 in the renewal of HSCs. Expansion of this program into directed differentiation of human embryonic stem cells (ESCs) and induced pluripotent state cells (iPSCs) (collectively called human pluritpotent cells (hPSCs)) arose from the desire to attempt to alleviate post-bone marrow transplantation immune deficiency, caused, among others, by defective T cell reconstitution. Furthermore, the capacity to generate thymic epithelial cells from human pluripotent stem cells will allow the generation of the next generation of “personal immune” mice. As the thymus develops from the anterior foregut endoderm, the approaches we developed also led to strategies to generate virtually every type of cell of the respiratory system from hPSCs. No sign-up required. For more information contact the iBEST Coordinator, Imran Sheikh (ibest@ryerson.ca). Come out for some complimentary coffee and snacks and learn/share about the research going in our network. From what started off as a statistical programming language, R was primarily an open-source alternative to other statistical packages such as SAS, SPSS, and STATA. Nowadays, R is a community-driven platform used flexibly by statisticians to developers, for not only statistical analyses but also software development, web development, and book publishing. PubMed is the free online interface of Medline, the database of biomedical journal citations and abstracts created by the U.S. National Library of Medicine. In addition to database searching, features include a citation matcher, a journal title locator, and a clinical queries search filter. This session will focus on effective strategies for searching PubMed, including instructions on how to incorporate MeSH (Medical Subject Headings) terms into your search. The battle for breakthroughs: Where health care innovators compete to win funding for their life-changing projects. Vote for your favorite to help shape the future of health care. This is a ticketed event through the St. Michael’s Foundation. A learning environment that brings together all medical staff, medical students, and trainees on weekly basis. Topics include up-to-date information on various issues related to health care. Presenter: Dr. Kamel Kamel from the Division of Nephrology. Have you ever thought about having a mentor to help your career? Or would you like to become a mentor? Come find out how to develop an effective mentorship relationship. Dr. Ori Rotstein, director of the Keenan Research Centre for Biomedical Science will present on Conditioning for Health. This presentation to targeted to a general audience. The presentation will also be available afterwards on St. Michael’s Hospital YouTube page. 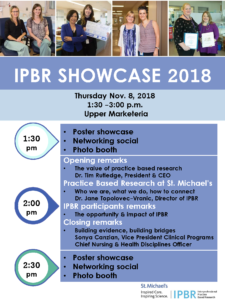 The Interprofessional Practice Based Research Showcase celebrates practice-based research done by St. Michael’s nursing and health disciplines teams. Learn more about the services the IPBR team offers to build research capacity and hear from participates as they share their experiences, results, and successes. 2. Wish to obtain a new UofT library card access. Online library access, provided by the University of Toronto Library, will be used for the exclusive purpose of supporting U of T faculty member(s) in their research. It is understood that U of T library online library access cannot be used in the support of any other responsibilities or duties that the same faculty member may hold at the Hospital (e.g. patient care or administrative roles for the Hospital). Support for such activities can be accessed through the hospital’s library. U of T reserves the right to deny and/or suspend access if users are found to be in violation of the stated terms and conditions. In the past, research staff were granted library cards, this has changed. The University of Toronto Library now provides hospital research staff (who support the research of doctors who have a faculty appointment at UofT), with a barcode and PIN number, which allows researcher staff remote access to the UofT Library licensed electronic resources. This remote access cannot be used for any other duties with which the individual may be involved. If research staff require hard copies of UofT library material they can request them through the St. Michael’s Hospital library hslibrary@smh.ca phone: x5059. FYI: We do not update U of T Library cards for physicians. We are responsible for updating the list for research staff only. Again, it is time to update the St. Michael’s list for U of T Library access. Only research staff who are supporting the research done by Principal Investigators who have faculty appointments at U of T.
Staff who work with doctors who do NOT have faculty appointments at U of T are unfortunately sent back to us as they are not eligible for U of T library access. Please note that all staff who have existing UofT library access with a barcode/PIN numbers, your barcode and PIN numbers will stay the same. The U of T Library will just extend your expiry date. 10. Indicate if your appointment or contract has length of stay and state start and end date below. Discussion of the WHO classification of brain tumours which uses molecular parameters in addition to histology to define many tumour entities. Discussion of the identification of brain tumours in the context of clinical relevance for Radiologists. An interactive session on commercialization of research, in particular companies founded by researchers here at St. Michael’s. The session provides a unique opportunity for researchers aspiring to commercialize their own work to hear first-hand about the challenges and rewards from those who have formed successful companies on the basis of their research. The Food as Medicine Update series was created to address the knowledge-gap in continuing medical education related to the role of nutrition in patient care. In this full day symposium, health-care professionals will learn about the most recent clinical research on nutrition and chronic disease prevention. This is one of two workshops that will provide you with strategies to lead your teams through the many change initiatives currently underway at St. Michael’s. Whether it’s to prepare to physically move your team to another location or prepare for partnership conversations with other hospitals, this workshop is built to assist you. This Leading Others workshop provides practical tools and templates to prepare for and manage change initiatives. Learners will learn to engage people and build employees’ commitment to accomplishing the change vision. Register through the Learning Centre, spaces are limited. Mendeley is a free online and desktop reference manager that can help you save PDF articles, organize citations, create bibliographies, insert references into your papers, and collaborate with other Mendeley users. In this workshop you will create your own Mendeley library and practice using its main features. Do you have questions or ideas that you would like to share with our Leadership? This is your chance to have an informal lunch discussion with Dr. Tim Rutledge, CEO and president. Advanced sign up is required as space is limited. Learn how to quantify the impact of your research. Manuscript Writing Boot Camp 6-048 Donnelly Wing, St. Michael's Hospital 30 Bond St. The Manuscript Writing Boot Camp provides allied health disciplines and nursing staff with a quiet space and dedicated time to write, while having access to experienced and published researchers for guidance and mentorship. These sessions include a didactic lesson on different aspects of manuscript writing and a creative activity to help inspire the writing process. The university of Waterloo is hosting an exclusive Science networking event to foster relationships between organizations in the science /health sector, and our Faculty of Science students, as well as, a chance to meet Science faculty and Co-op staff. This event will be an opportunity for Researchers who hire for science related positions to meet and network with our upcoming Science graduates to discuss science related opportunities. This is also an opportunity to Promote your company and network with University of Waterloo co-operative education students and staff. The University is pleased to invite those interested in learning more about funding opportunities for Canada-US research collaborations through the National Science Foundation (NSF) to an information session to be held at the time and location noted below. A learning environment that brings together all medical staff, medical students, and trainees on weekly basis. Topic include up-to-date information on various issues related to health care. This hands-on workshop will provide an overview of why nursing and health discipline clinicians are well suited to identify gaps in knowledge and clinical practice, and will include practical exercises to guide you in developing a practice-based research question. The goal of this event is to have faculty direct their own learning and networking. The sessions are structured with four tables dedicated to different topics with two facilitators at each table who can speak on the subject matter being presented. Faculty will have the option to approach a table and ask questions or simply mingle with others. The University of Toronto is pleased to invite those interested in learning more about how to initiate, grow and deliver on collaborative research partnerships with global multinational corporations to a panel & information session to be held at the time and location noted below. Do you have questions or ideas that you would liket o share with our Research Leadership? This is your chance to have an informal lunch discussion with Dr. Ori Rotstein, Director of the Keenan Research Centre for Biomedical Science. Advanced sign up is required as space is limited. Searching the grey literature is an important part of conducting a systematic, scoping, or other comprehensive literature review. However, grey literature can often be tricky and overwhelming to search. This workshop will define what grey literature is and is not, identify key grey literature sources, describe how search for this information type, and more. This workshop is recommended to anyone who is currently conducting a systematic or scoping review, or who is planning to conduct a systematic or scoping review. It will also be applicable to any individual who is interested in searching grey literature for other purposes. AERO Open house Allan Waters Family Simulation Centre, Lower Level 38 Shuter St.
AERO's leads, scientists, students, and collaborators will showcase the latest in health professions education research methods, as well as their projects and products/impacts for clinical teaching and practice. AERO’s leads, scientists, students, and collaborators will showcase the latest in health professions education research methods, as well as their projects and products/impacts for clinical teaching and practice. Writing Workshop - Concise Abstracts 16- 101 Cardinal Carter Wing 30 Bond St.
Communications and Public Affairs is the network’s team of storytellers, information advisers and media experts. We can work together to make sure information about your work reaches the right stakeholder at the right time. Come to this interactive workshop to learn how to work alongside us to tell your story. In collaboration with iBEST we will be opening our brand new microfabrication core facility for the institute. Come learn about Multiple Sclerosis research. This Symposium will feature presentations from renowned MS Scientists, including Dr. Jiwon Oh, Dr. Dalia Rotstein, Dr. Raphael Schneider & Dr. Shannon Dunn, followed by a panel discussion led by the MS Centre’s Medical Director, Dr. Xavier Montalban. Topics presented and discussed will cover the spectrum of MS Research, from basic science to clinical research. Coaching employees to develop their knowledge, skills and performance is a key attribute of effective leaders. As a manager, it is important that you help your people learn and grow. Coaching employees to develop their knowledge, skills and performance is a key attribute of effective leaders. As a manager, it is important that you help your people learn and grow. In this two module workshop, participants will gain understanding of a coaching approach, some practical tools and have an opportunity to practice. Register through the Learning Centre, spaces are limited. Dr. Joey Bonifacio, adolescent medicine pediatrician at St. Michael’s Hospital, and Dr. Jessica Sutherland, psychologist at Ryerson University, will discuss findings from a photovoice project involving homeless and street-involved youth from Toronto. Youth were recruited to be active participants in taking photos to document their lived experiences. Along with interviews, these photos will be shown to promote and engage dialogue concerning youth homelessness — What does it mean to be homeless? How do we go about understanding this marginalized community through their eyes? Do you have questions or ideas that you would liket o share with our Research Leadership? This is your chance to have an informal lunch discussion with Dr. Patricia O’Campo, vice-president, Research (Interim). Advanced sign up is required as space is limited. 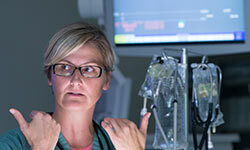 Have you previously been an ICU patient? Or a family member/caregiver to someone who has? The purpose of this session is to introduce patients to the role of research in improving care in the ICU, and in particular to a new research model that the Canadian Adaptive Platform Trial (CAPTIC) team is developing. The research model aims to engage patients, accelerate knowledge generation and merge clinical research with quality improvement. A learning environment that brings together all medical staff, medical students, and trainees on weekly basis. Topics include up-to-date information on various issues related to health care. Rajeev Sharma of Ryerson Univeristy will be presenting on health care laws. The Valedictorian is a documentary that follows one woman on her harrowing journey with Schizoaffective Disorder as she returns to her hometown seeking the healing power of forgiveness. These bi-weekly seminars highlight some of the ground-breaking clinical and population health research being conducted at the Li Ka Shing Knowledge Institute. EndNote is an application designed to organize references for use in manuscripts, grants, CVs and other documents. The software creates files that are essentially a record of your publications, database search results, or citations culled from your reading. What do I need to know to ensure a smooth REB submission? Let's talk about the details, common pitfalls that may delay your application, and any other questions you have. What do I need to know to ensure a smooth REB submission? Let’s talk about the details, common pitfalls that may delay your application, and any other questions you have. Supporting the patient journey when on constant care: A patient focused approach Come out to hear about evidence-based nursing and cutting edge work being led by our nursing staff at St.
Come out to hear about evidence-based nursing and cutting edge work being led by our nursing staff at St. Michael’s. Collaborative approaches to conducting and applying health research Patient-oriented research has come to the forefront of health care research, placing importance on making research more relevant to the populations it targets. Patient-oriented research has come to the forefront of health care research, placing importance on making research more relevant to the populations it targets. This presentation will focus on various ways patients and researchers can collaborate on research, and will highlight examples of POR projects, meaningful engagement, and common barriers to engaging in POR from both patient and researcher perspectives. 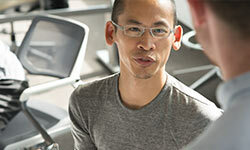 Do you have questions or ideas that you would like to share with our research leadership? This is your chance to have an informal lunch discussion with Dr. Arthur Slutsky, past vice-president (2000-2018). Advanced sign up is required as space is limited. For more information, please contact Dina Coronios-Antoniou, coordinator of the Keenan Research Seminar Series, at 416-864-6060 Ext. 7830. Join your St. Michael's Research Student Association for a discovery scavenger hunt! Make new connections while exploring St. Michael’s Hospital and the communities around us. If you’re new to St.
Join your St. Michael’s Research Student Association for a discovery scavenger hunt! Make new connections while exploring St. Michael’s Hospital and the communities around us. If you’re new to St. Michael’s or to Toronto, this is great opportunity to get to know your new home while meeting your fellow staff and students! The winning team will receive a prize! Free pizza included! We will honour six outstanding individuals for their contributions and dedication to research within our network. Three Keenan Awards and three LKSKI Awards will be presented; one of each to a scientist, staff member and trainee. Researchers can learn the ins and outs of donor relations and how to engage your amazing projects with the foundation! The CRICH U of T Chapter proudly presents an exciting day with keynote lectures and interactive workshops with distinguished scientists, leaders in academia and experienced mentors on Tuesday, November 27 at Li Ka Shing Knowledge Institute (209 Victoria Street) Allan Waters Auditorium from 12-3:30pm! Talks, panel discussions and breakout rooms will feature Drs. Reinhart Reithmeier, John Marshall, Jane Batt, and Kati Szaszi. The aim of this event is to expose promising graduate trainees to the applicability of their critical thinking skills to multiple career avenues. The 10,000 PhDs seminar was spearheaded by Dr. Reinhart Reithmeier – an award-winning lecturer and mentor in the Department of Biochemistry at the University of Toronto. Most notably, his leadership was recognized in 2012 by his election to the Canadian Academy of Health Sciences. Room 1: Reinhart Reithmeier – How to network with scientific experts and leaders. Room 2: John Marshall – How do I become the best mentor for my mentee? Room 3: Jane Batt – The importance of women in science and engineering: determining if it is the right fit for you. Room 4: Kati Szaszi & Andras Kapus – The difference in attaining a PhD in 2018 and years prior. We will also have a raffle to raise funds for the Rotary Transition Centre of St. Michael’s Hospital. Two winning tickets will have paid dinner with all the invited speakers on the night of Nov. 27th between 6:30-8:30 pm! If you are interested in attending, please register using the link below! Where are U of T’s PhDs employed? From professor to CEO, assistant deputy minister to creative director, they are working in all sectors of society and in 97 countries around the world. Come find out what career options are available following a PhD. Join us for a lecture by Dr. Howard Chertkow, who will present an overview of the development and evaluation of the most promising approaches to preventing cognitive decline. The Jackman Humanities Institute at UofT is pleased to present a Humanities-focused SSHRC Insight Development Grant workshop, in anticipation of the SSHRC IDG deadline of February 1, 2019. This workshop is open to all SSHRC eligible University of Toronto faculty members. Regisration required? : Yes, please email Monica Toffoli at jhi.admin@utoronto.ca to register. Come hear about the groundbreaking work happening in our network in the field of HIV. The Biomedical Zone invites you to join us for an evening of product demos from our resident startups, some of Canada’s most innovative health tech companies. You’ll have the opportunity to network with founders and explore the ground breaking health tech they are working on, which is everything from artificial intelligence, virtual reality, to software and hardware devices. Come visit the Keenan Research Centre for Biomedical Science and learn about the amazing basic science and translational research that is happening here. Pizza lunch will be provided. This event showcases the two programs’ exciting research, clinical practice, and education initiatives. The theme for this year’s event is ‘Vision, values and common bonds: Shaping a healthy future.’ We are thrilled to have Dr. Patricia O’Campo, interim vice-president of Research as the keynote speaker. Research scientists/staff will be go up against a team of research trainees in a battle of wit and trivia. Questions will be set by the researchers on staff in the Health Sciences Library. Come out for this fun event and support your team! Do you want to meet your colleagues and network with members of the St. Michael's Hospital community? Come out to the St. Michael's Hospital Research Student Association November Social. Refreshments will be provided. Do you want to meet your colleagues and network with members of the St. Michael’s Hospital community? Come out to the St. Michael’s Hospital Research Student Association November Social. Refreshments will be provided. Medical mistakes lead to as many as 440,000 preventable deaths every year. To Err Is Human is an in-depth documentary about this silent epidemic and those working quietly behind the scenes to create a new age of patient safety. This features research from our own Centre for Surgical Safety.